This year at Entropy we’ll be rewatching the legendary Neon Genesis Evangelion. Join us on this tremendous journey through one of the best television series ever made. We’ll be watching the subtitled versions and discussing them here every week without spoilers. This is the last line of dialogue in the first episode of Neon Genesis Evangelion, which, I think, does a good job of setting the tone for the rest of the series. But we’ll get to that over the next couple months. The show begins in 2015 with an obscured view of a something large swimming through the water. We see tanks waiting and a city abandoned and destroyed while the loudspeaker calls a State of Emergency through the empty streets, a rundown blue car driving and finally a boy waiting for a ride while the world stops. Impacts from the distant battle rattle the city and then he sees planes followed by a giant monster. Needless to say, the boy is shocked, only to become more shocked as the planes attack the monster to seemingly no effect. He then watches it destroy the ships with ease. And then his ride appears, driving to avoid the giant monster but also the attacks of the military. The boy and the woman drive through the city while the giant monster makes the military–referred to as the JSSDF, or Japanese Strategic Self Defense Force–look childish. Tokyo-3, the current Japanese capital and setting of this episode, has emptied in the face of the giant monster and is gradually being destroyed. Seeing that their military efforts are all but useless, the JSSDF drops an N2 mine, which stands for a non-nuclear mine. Despite the immense power unleashed, it has no lasting impact on the monster, but the blast flips the car our characters are in. Finally we get some names. Our young boy is Ikari Shinji and our blue car driving woman is Katsuragi Misato. The two have a humorous little back and forth in the car as they drive towards Tokyo-3, the underground city and headquarters of NERV, the hope of humanity’s future. This first episode covers a lot of ground. It manages to introduce many of the major players of the series as well as establishing the overarching conflict and context. It builds the world of Evangelion while hinting at a much bigger and more interesting truth beyond these first 25 minutes. Katsuragi Misato, a flighty NERV officer with the rank of Captain. Ikari Shinji, the Third Child. A fourteen year old boy who was abandoned by his father, Commander Ikari, and tasked with piloting EVA 01. Commander Ikari, the commanding officer of NERV, responsible for the EVA program. Deputy Commander Fuyutsuki, Commander Ikari’s right hand man. Akagi Ritsuko, NERV’s head scientist. Ayanami Rei, the First Child. Another EVA pilot who appears physically brutalised. We also discover that NERV is a secret military organisation created by the UN to combat the giant monster that arrives in Tokyo-3. Much of NERV remains mysterious and ill defined after this episode, but that’s what the remaining 25 episodes are for, yeah? 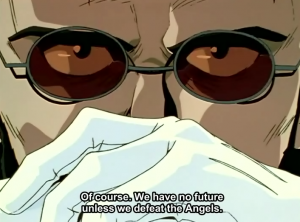 Due to the failure of the military to stop the monster, the UN gives Commander Ikari and NERV control of the operation. His plan, to use the EVAs. Shinji doesn’t know he’s meant to be a pilot. He doesn’t know anything. He hasn’t seen his father in three years. He knows nothing of NERV or EVAs or the giant monsters, referred to as Angels. Shinji is just a boy. A boy scared and at least a little depressed. He’s told he must fight the giant monster he just ran from, that he saw swat away and destroy tanks and planes. Three adults stand over him and demand that he get into the giant robot submerged in water. This sums up Ikari. A man devoted to his mission, to keeping humanity alive at any cost. Even if that cost is the life and well-being of his own son. Shinji, after seeing Rei and being saved by the EVA, decides he’ll be their pilot. While this is going on, the Angel is shattering through the Geo-Front that separates Tokyo-3 on the surface from subterranean base of NERV. 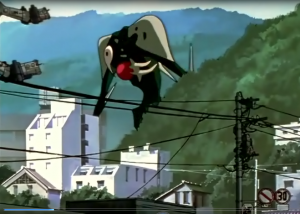 No weapon can stop it and it wanders Tokyo-3 in search of NERV. 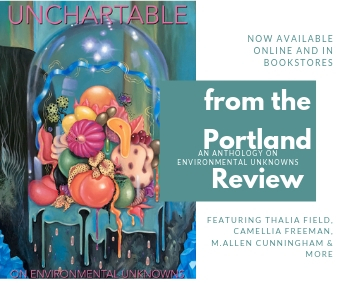 Why would it seek a city buried beneath the surface? If you have questions about the show and the world and the characters and the story, that’s normal. This is not a show that gives everything to you. In fact, even some of the background to the series remains a mystery at this moment, though it might prove useful for viewers. Much of what we know at the end of this episode is mostly conjecture and inference. Fuutsuki mentions that the Angels have returned after fifteen years. And that’s the only backstory given in the episode to the current conflict. We get other hints of life before this episode. We know Misato is struggling to keep herself financially independent. We see the day Commander Ikari left Shinji when he was only a child. We know Rei’s an EVA pilot, but not the normal pilot for EVA 01. We also know she must have been in some kind of active combat before this battle against the Angel destroying Tokyo-3. We can infer that the JSSDF has little to no regard for Commander Ikari and NERV, which is unsurprising, since it’s an organisation given powers that override the nation’s military. Because we’re thrown into this world in the middle of a conflict, there’s much we simply don’t know. But I don’t think it matters. In fact, I found it difficult to not move onto the next episode after this first one ended. It felt silly to only watch one, especially since it stops on a cliffhanger. Shinji in the EVA being launched to the surface to fight the Angel. 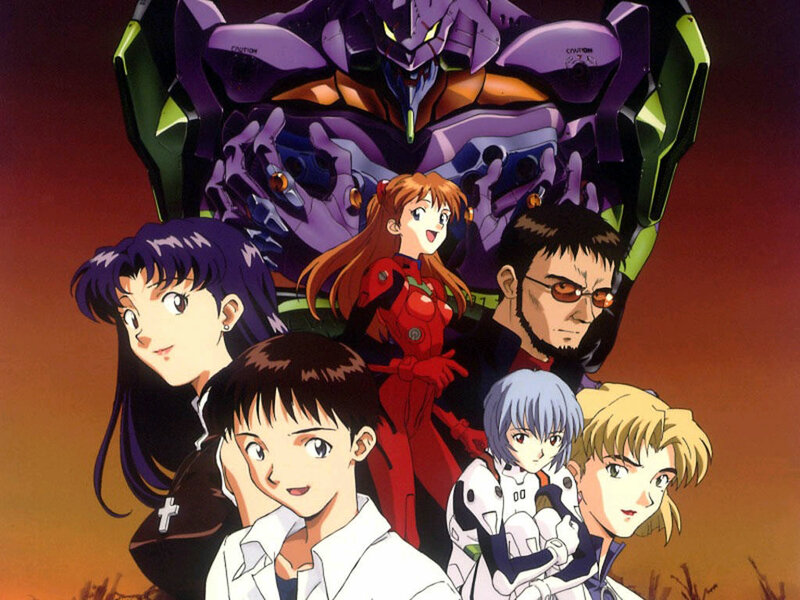 Neon Genesis Evangelion came after dozens of mecha-anime. It’s a concept nearly as old as anime. A group of youths save the world or the universe by piloting giant robots against other giant robots or giant monsters or whatever else. There are so many series and even movies that begin with this concept that it would be tedious to even begin listing them, but american audiences are probably most familiar with Power Rangers or Pacific Rim. 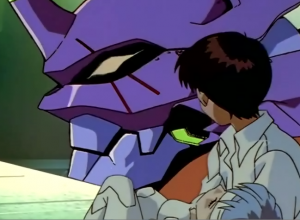 Though Evangelion is descended from a long line of mecha-fiction, it does much to reinvent and critique the genre while firmly planting itself within that genre. One of the driving shapers of this series come from its creator, Hideaki Anno (who worked on many Studio Ghibli films as an animator and also voiced Jiro Horikoshi in Miyazaki’s The Wind Rises). Anno was dealing with a lengthy and severe bout of depression while working on the story for the series and then the series itself. Perhaps due to this, we see the psychology of the characters given much more focus than one would expect in a cartoon. Right from the start, we see Shinji’s anxiety, his fear, and the pain his father has caused him and the pain he continues to cause him. Misato asks Shinji why he agreed to come to NERV, and it’s hard to imagine that there was any reason beyond his desire to see his father. A meeting he desires but is also torn apart by. This is the man who abandoned him when he was young, who only now speaks to him out of need. Not a psychological or paternal need, but a need governed by Shinji’s apparent usefulness as an EVA pilot. When Shinji refuses to pilot, his father casts him away once more. And then we also see that piloting an EVA is not the same as piloting a Gundam or Voltron or Megazord. For one thing, EVAs appear to respond to the biology and psychology of its pilots. It submerges the pilot in the LCL, a liquid that allows for mental linking between the pilot and the EVA while also giving the pilot life support. There is a distinctly biological link happening between human and machine in EVA. Needless to say, this is a bit different than moving the proper controls in order to operate your giant robot. Yes, the world of Evangelion is vast and complex. But much of this will come up often over the coming months of our Evangelion discussions. For now, we have an intriguing start to one of the most beloved cartoons ever made. 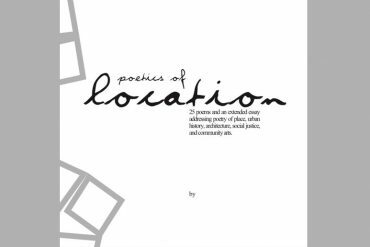 It hints at psychological depth and cataclysmic events while also offering moments of humor, even while the world falls apart.